After reading Edge of Destiny through, it’s been pretty hard to not spoil things for people. Not everyone can go out and grab the book, read it within a 24 hour period, and then digest things in a coherent manner. Which is why I’ve waited a few days to post what there is about Logan Thackeray and his profession. Throughout the book, and even on the back cover, there are mentions of the word Guardian. 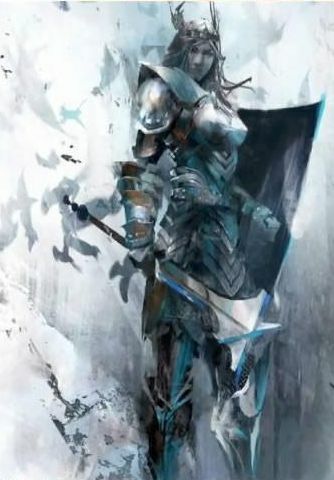 It all seems to point to the name of the “new monk” class for Guild Wars 2. Here’s part of the back cover, giving a brief description of Destiny’s Edge. Eir, the norn huntress with the soul of an artist; Snaff, the asuran genius, and his ambitious assistant Zojja; Rytlock, the ferocious charr warrior in exile; Caithe, a deadly sylvari with deep secrets; and Logan, the valiant human guardian dealing with divided loyalties. Most of those descriptions avoid blatantly labeling the characters with a profession. Eir is clearly a ranger with Garm as her pet, but she’s described as a huntress. Caithe is deadly, but never really described as (while not for certain, a likelihood) an assassin. Rytlock is however described as a warrior, and this isn’t the last time Logan is described as a guardian. But first, some of the magic he uses. The moment before the axe-rifles fired, Logan Thackeray swept his hand out in a fan. A blue aura bled from his fingertips into the air, solidifying it in a curved wall before the scouts. “Fire!” the charr centurion roared. The axe-rifles boomed and vomited smoke and lead. But the shots struck ehtereal membrane and sank into it and were eaten away. Bullets showered rust to the ground. As if the blue aura weren’t hint enough, the defensive magic that protects the humans from the charr is pretty telling. A wall of defense, just as an elementalist might have a wall of fire. His hand painted a blue aura in the air, a slim band meant to trip up a Destroyer. His pursuer swung a stone claw that missed, then stepped in the long grass and tripped on the guardian aura. The Destroyer overbalanced and crashed into the ditch. A blue aura lit Logan’s hands and spread to encompass his hammer. The glow seemed to hoist him into the air, and he brought the weapon down in a massive overhead stroke. The blow struck the creatures solar plexus and shattered it into five pieces. A fairly direct mention of the aura as being a guardians. I don’t think guardian makes sense in any other context here other than as a profession. Notice too, that the trip wire is certainly more of a support or control spell. Protecting the group and slowing down the enemy. The hammer buff that delivers Logan’s blow with enough force to shatter his foe is also support. None of his magic so far delivers any kind of direct damage. Later in another battle there is a flurry of mentions. Logan flung out his hands, and a blue ball of energy deflected the blade. Blue aura erupted from Logan’s hands and swarmed across his hammer. He hauled it overhead to smash into the sand. A profound boom shook the bearbaiting den, flinging Rytlock back against the half-wall. Logan’s hand painted an arc of blue energy in the air before him. He staggered back as Rytlock thudded into the magical shield. Arcane energy sparked across the charr’s front but Sohothin cleaved through. An arcane shield, blue energy deflecting blows, and a buff (perhaps the same, perhaps not) that causes a knockdown. All to protect, defend, or control the movements of foes. A short while later there is the first mention of healing. So we have healing, but not instantaneous healing or strong healing. Slow and steady healing from Logan. A clear change from the monks of Guild Wars. However, it’s not as though it takes too long, by the next morning “Rytlock’s wrist was fully healed.” However it’s not good enough for others. Blue aura erupted from Logan’s fingers, and he touched the wounds in his brother’s chest. They glowed, flesh beginning to knit, but the holes were too wide. Those fingertips of Logan get a lot of work. A blue aura gushed from Logan’s fingertips and wrapped around his hammer. He hoisted the weapon overhead and roared. The enspelled weapon crashed into the head of the harpy and broke it free from the body. The words “enspelled weapon” make it very clear exactly what’s happening. He jumped back and flung his hand out. His fingers smeared blue aura in the air, solidifying it in a shield before Zojja. The Icebrood pounded up to the shield but couldn’t reach the asura apprentice. Logan meanwhile painted blue aura in the air around the asura, making a shield that would guard them. There are also various mentions of Logan being the defender of the group. Later Rytlock calls him “our best defender.” An obvious theme of defense, and protecting runs through much of Logan’s action scenes and even his story. It makes everything pretty clear to me, and I’m presuming many others. Although there are only a few mentions of the word guardian I think anyone would be hard pressed to make good arguments against it. There isn’t much room for misinterpretation. However, I’m sure it’s possible that Logan’s profession could be called something else. While I’m at it, if I failed to note any mention of engineers, the seeming consensus as to what the brand new profession would be, I would be in error. Doesn’t really point to much. I can’t really say it’s evidence of anything. A primarily defensive class kind of intrigues me, considering Arenanet’s desire to shift the focus to offensive gameplay. Ah well, won’t know until its in my hands. true but he also has offensive abilities, the buffs he uses on his hammer seem quite powerful. However they did say there would be a class that focuses on support, and this appears to be it. So after years of designing Guild Wars 1 they develop a TANK that somehow reminds me of LOTRO’s Warden or simply a Paladin – a little group healing and healing. I just got afraid this is simply a trinity with the healing part integrated into Damage Dealer/CC and Tank classes. Oh well, time will tell. I just felt the chill of DIKU Wars going down my spine. Well it is a game-tie in book, other than that I’m not sure what you mean, since the book takes place 5 years before gw2. You might mean that at times the action seems to be an advertisement for the class, in which case at times I agree. However I’m not sure I’d call it horror. Just to be clear logan at no time group heals anyone, and what healing he has isn’t enough to save the one person he uses it on in a life threatening situation. However you may be right. 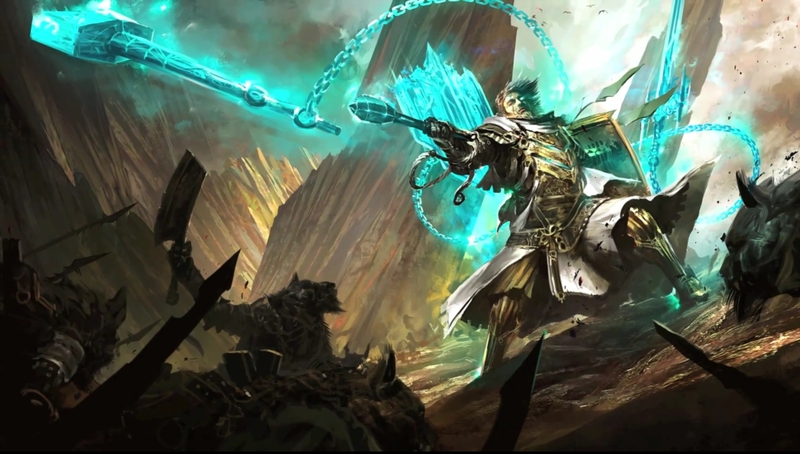 the gw2 trinity doesn’t seem so far off the classic trinity as arenanet would have us believe. We should also keep in mind this is a book, not gw2. It’s gone in the sense that you don’t have to commit to healing, but can transition between roles with more fluidity than is present in other games. You can’t respec for heals in WoW without flat-out leaving and you are pretty underpowered if you try to heal with a DPS build as a priest or a pally, but a ele can switch atunements, even mid-fight should the need to switch from DPS to heals arise, and without penalty. some pretty good points aly, thanks for chiming in. ahhh i tried to warn you with the bolded “heavy spoilers” thing at the top. Thank you so much! The heavy use of painting makes me think the author has seen some stunningly artistic gameplay effects. Possibly, but maybe he just likes the world of art. Either way i’m sure he may have played the game. Hmmh, apparently the next profession IS The Guardian. indeed sir, can’t wait to see the update on thursday.